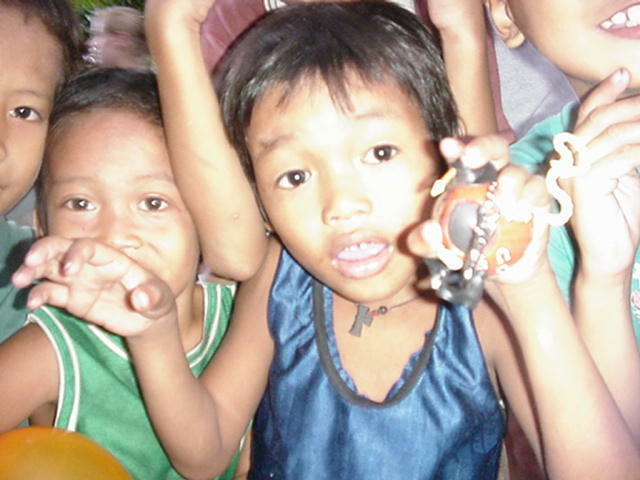 On our fifth day of the trip and after our final morning with the Children’s Shelter of Cebu, we took the Jeepneys into a squatter’s village near the Cebu Central Free Church. 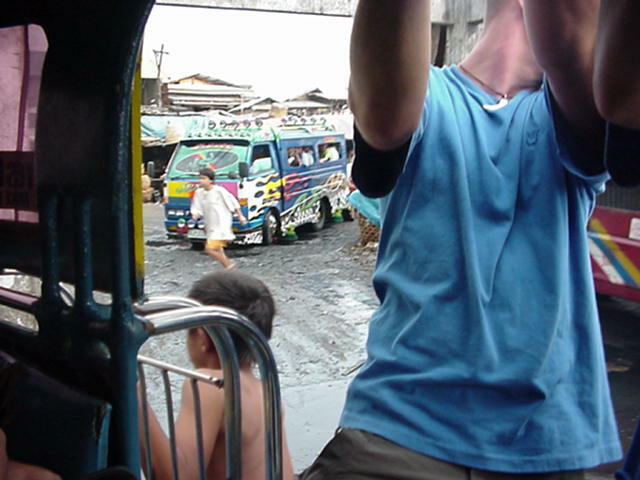 We could barely get the Jeepneys into the area because the roads were so narrow. 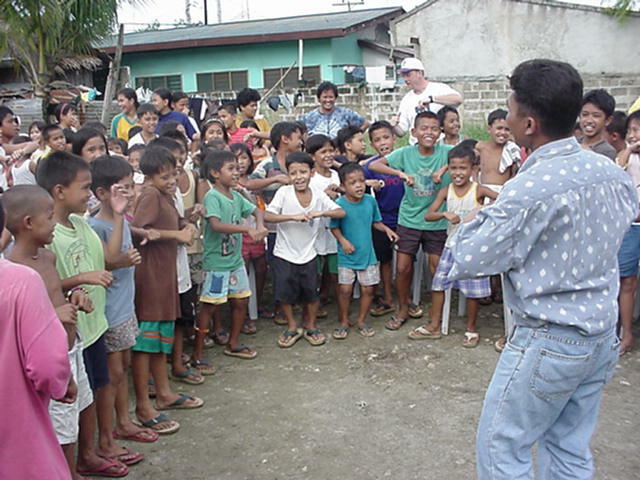 Before we could get started with the music and puppets, the Filipino kids gathered together in front of us and treated us to their own performance of song along with synchronized movements. It was beautiful! It turned out that they had learned the song at the Central Free Church. 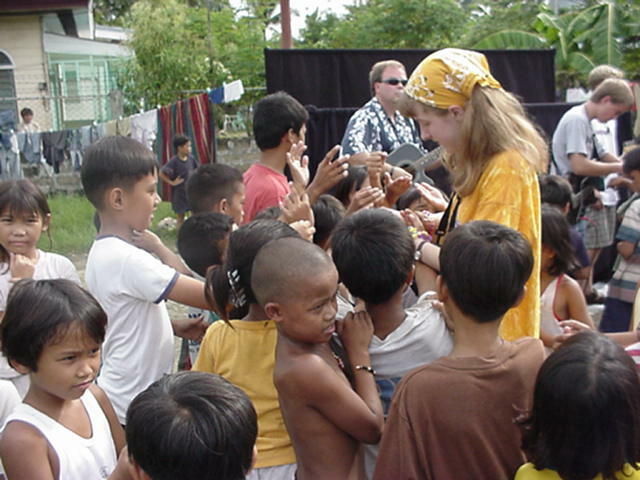 Since this situation was in an open field and not confined to a fenced-in environment, we were surrounded by mobs of people and hundreds of outreached hands when we passed out the care packages. We gave away anything and everything we could find, including our pens and personal snacks. After everything was gone, they even took the cardboard boxes that once held the care packages. 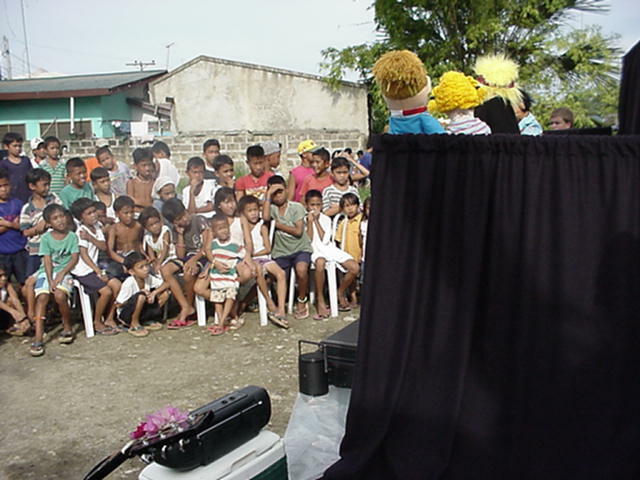 Angelo was there and was one of the few adults who came down to watch the puppet show with the kids. I noticed that Angelo was watching from the curb across the street when we were saying goodbye to the kids. It was another one of those heartbreaking memories. It felt as though we were leaving one of our own behind. Thankfully, however, he had been introduced to many in the church and it was our prayer that he would stay connected with them. That afternoon we went to an inside Market which would be comparable to an indoor flea market here in the States. We did our best to spend all the money we had while we were there but that took some work considering the fact that pesos were 44.38 to the dollar. It took 7,500 pesos to buy $150 in souvenirs. The seven women that packed up our items and served us were giddy by the time we left. Our favorite souvenir was a hat for Randy made out of frog hides. This was the evening when Jessica found a small lizard in the tub at the guest house. She thought it was so cute that she tried to pick it up by the tail. However, the lizard shed its tail and left the tail wiggling in her hand. Needless to say, Jessica freaked out. Monday was our day to go to the beach and rest. The private beach club we went to was clean, had a cement wall around it, and was a sight for sore eyes. I did not understand the purpose of the wall until I was out in the water and looked back to see that there were more squatters on the other side of that wall. It was difficult to stay focused on a day of rest with this reminder just a stones throw away. Here is a picture of the divide. Our devotions that day were about perseverance and how God works through trials. We were a little over half-way through the trip and as we reminisced and looked back over the long week, people started missing their families back home. We were not sure if we were going to be allowed to teach religion in the school because, in order to do so, all the kids had to bring back their permission slips. It turned out that they all did. Therefore, we were allowed to go in to present a 20 minute story to each of the classes. 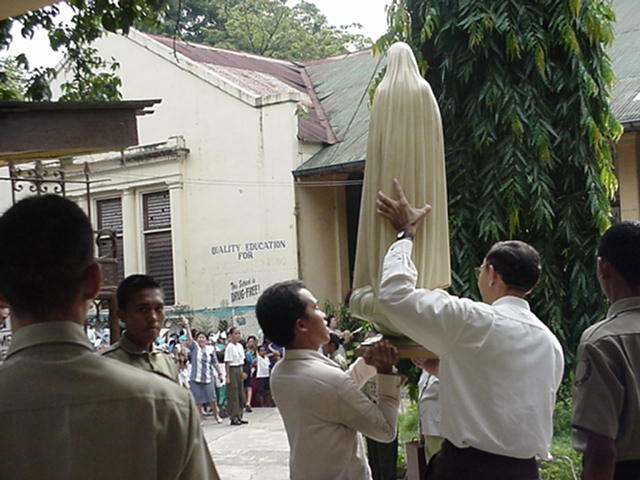 Here we are waiting for their procession and worship of the Virgin Mary before school started. We tried to use puppets during the first presentation but the class did not pay attention and got a little carried away so we did not use them after that. 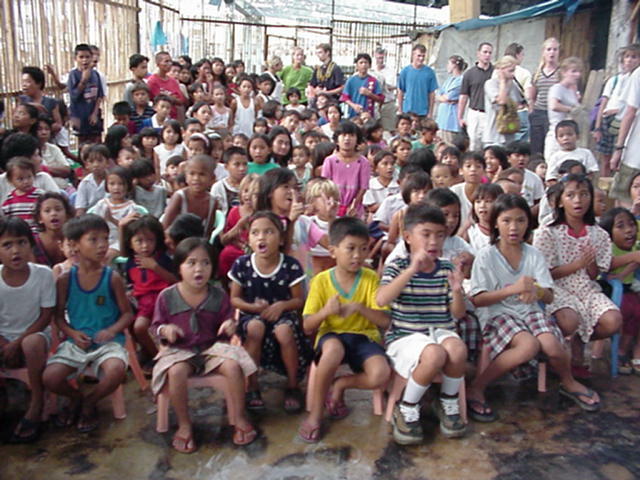 We quickly learned that the Filipino children have a short attention span and the teachers keep their attention by having the entire class repeat a lot of what they say. A few of us walked through the squatter’s village, bought up all the bread from the local baker, and passed it out as we walked along. There were some very educated people living in those tin and cardboard houses. We met nurses, teachers and a mechanic. One of the problems is that there are just not enough jobs available for everyone. Because our presence brought so much attention, the churches had big turnouts during Sunday services the next week. 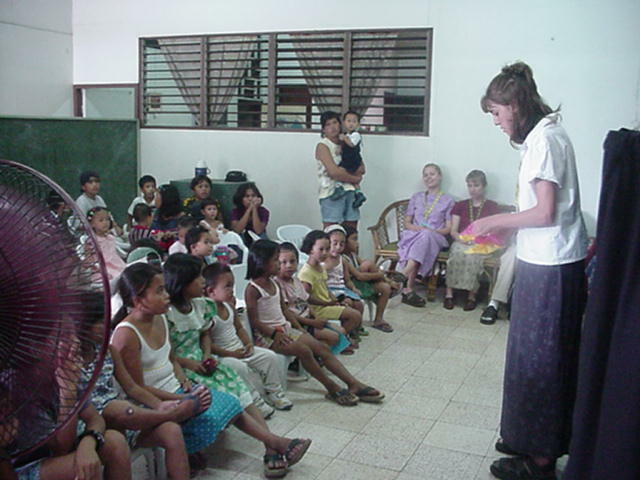 Therefore, they set up Bible study groups to continue their work with those who were new to the church. And, the Alliance Church was expecting to have another congregation in their area within three months. Knowing that gave us a little peace for the ache we felt when we had to return home. After the singing and puppet show, Jessica, Rachael and I took out the bubbles again. However, this group was pretty wild. It was not long before we had to put the bubbles away because the kids were pushing and shoving so much that they started slipping on the soap that spilled on the dirty cement floor. There was even one boy who kept dipping his hand in the soap to coat with hair. 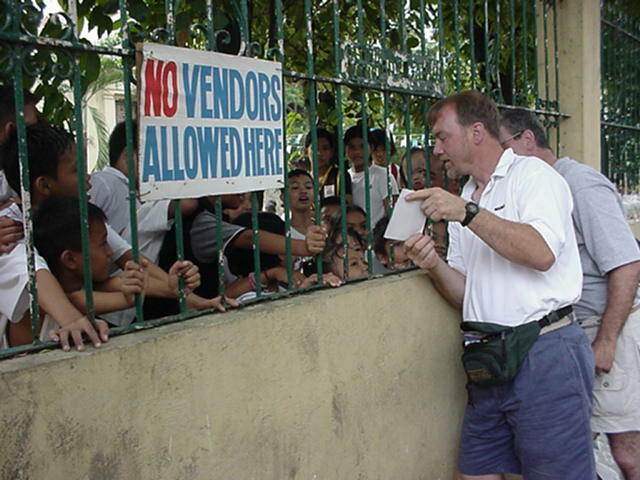 In my journal I wrote: “I now realize one of the reasons we are here in Cebu is to be an encouragement to the churches, students, Children’s Shelter, and the people in the squatter’s villages. I left on this trip assuming I was going to get something done. However, it really came down to equipping the Cebu churches and encouraging them to serve and reach out to their own people.” The Filipinos told us that because we flew all the way to Cebu to be with them was an encouragement in itself. After ten days in that moist salt air, our cameras were wearing down and even the guitar strings had started to rust. 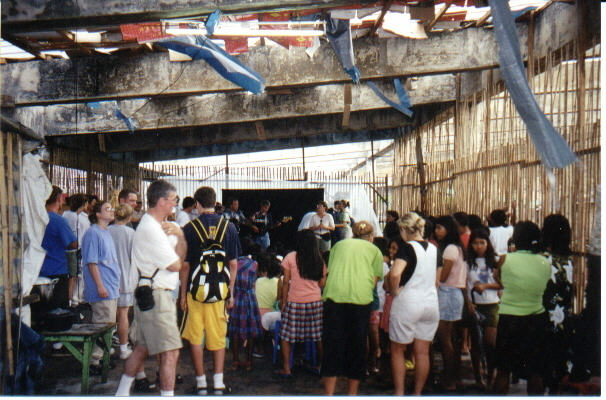 We left behind all of the puppets, equipment, supplies, and even some of our clothing with the churches and shelter. This time we did not have a stop in Honolulu but had a 13 hour flight from Manilla to Los Angeles. Thank goodness we had a four hour layover in LA because it took us three hours to recheck our bags. All of our flights were once again late. However, because there were so many of us, the subsequent flights did not leave without us because the airlines did not want to have to put 30 people in hotels. I experienced my first episode of culture shock in LA when I saw a man standing at the airport McDonalds yelling at the cashier because he did not get what he had ordered. This was a shock because we had just spent the past two weeks interacting with friendly and gracious people. They were not loud and angry but instead soft spoken and gentle. Needless to say, we were exhausted when we got home. Even to the point that Jessica fell asleep in the hallway while petting the dog. 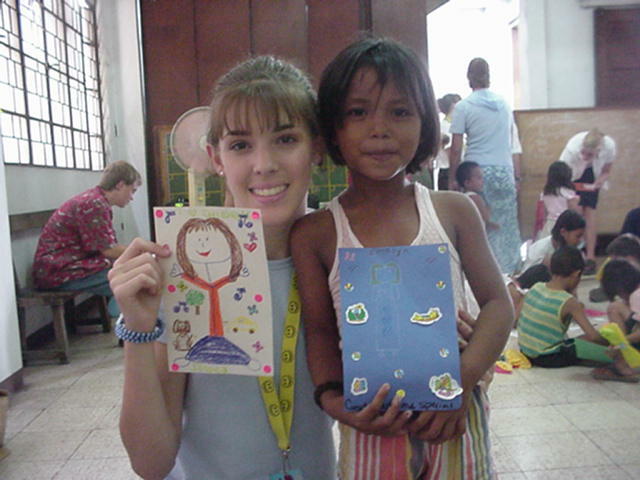 Rachael had a head cold that she had been battling for days and then developed an ear infection. My eyes were so infected that it took two prescriptions and weeks for them to get back to normal. Recently, a friend pointed out something I had never noticed before. If you read Matthew 25:31-46, notice that when Jesus separates the sheep from the goats, his judgment is based on whether they fed the hungry, gave water to the thirsty, invited in strangers, clothed the poor, and looked after the sick and those in prison. Do not worry about what it is you should do. Start by making yourself available and willing to be used by God. 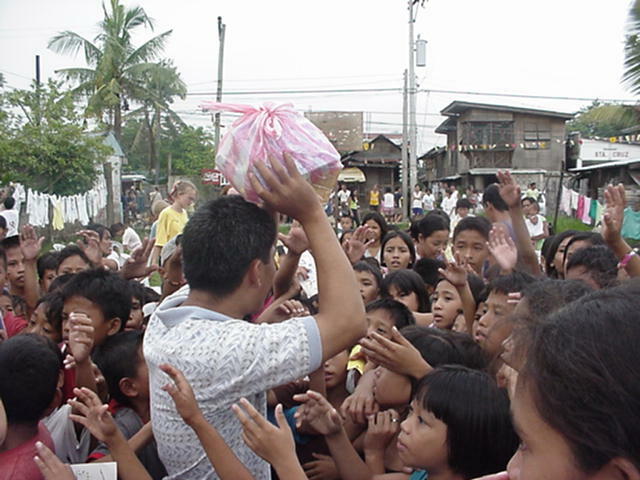 Just do something to extend the love God has shown you whether it is locally or overseas.